Overexertion Injuries – these occur when workers lift items that are big and heavy for a long period of time resulting in excessive physical effort. Injuries can occur to joints and ligaments. Also, in the warehouse, workers walk to pick orders. The trip length between picks can be quite long, especially if the warehouse is not organized properly. 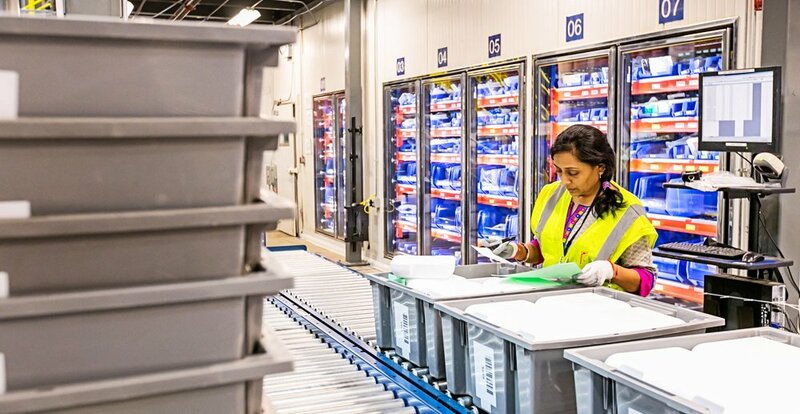 Properly planned pick paths, SKU rationalization and appropriate slotting of SKUs can help to cut down the length the worker must travel to fill orders. Lifting and Handling Materials – Improper handling of boxes, pallets, cartons and items can cause strain and injury to different parts of the body, especially the back. Heavy, big objects should be placed in the “golden zone,” where workers do not have to bend, reach or lift above their shoulders or below their waists. Slips, Trips and Falls – Each year, more than 8 million Americans will be treated in emergency rooms due to an accidental fall. If items are store haphazardly within the distribution center, such as sticking out too far from a shelf, or placed in the middle of an aisle, workers can easily injure themselves by tripping over or running into these items. Making sure floors are dry and slip resistant can prevent slips, trips and falls. Falling Objects – Items not stored properly can fall and inure someone. If the storage racks do not have end-caps, items can just slide right out onto the floor causing injury. For example, UNEX Keg Flow features side rails to help steady heavy beer kegs, a custom hanger to provide fractional pitch and a high roller stop so that kegs don’t topple off the end. Forklifts – Most accidents occur in a warehouse at/with the docks, forklifts, conveyors, storage units and manual lifting/handling. Forklifts can overturn or they can be overloaded, subjecting materials to falling off. Accidents between forklifts of between a forklift and another surface can cause serious injury. Statistics show that 1 in 10 forklifts are involved in an accident each year. Operators need to check hydraulic levels, tire pressure, engines, controls, steering and brakes each day to make sure all are working properly. Loud Noise – Tools, equipment and machinery that makes loud noises can cause hearing loss. Ear protection should be work by workers in this environment. The single biggest source of noise and threat to workers’ hearing is often the radio they carry. In order to be heard above the din around them, the radio must be at least three decibels louder. But dB Blockers are designed to integrate with all modes of communication, so workers can communicate and hear clearly at all times while staying protected. Unstable Packaging – Packaging is being made more flimsy in an effort to reduce cost and waste. As a result, things like cardboard boxes are being replaced by cardboard slats covered in plastic, which are more unstable when loaded. Workers need to pay particular attention to avoid dropping contents or injuring themselves by lifting flimsy packaging. Don’t Overload Carts – Carts help carry products or cartons during picking operations. Make sure that the cart can handle the load and that the items stacked on the cart are not above the picker’s level of vision so you won’t bump into any items, causing the cart to spill. Ergonomics is important in the warehouse for safety as well as productivity. Products need to be handled correctly in picking and packing operations to reduce the risk of injury from improper handling. That's why UNEX emphasizes ergonomics in all of its solutions- whether it's picking from the Golden Zone or keeping tools within easy reach at a packing station, our solutions take into account these warehouse hazards and minimizes them for a safer, healthier, and happier workforce.